has some standout features. The device itself is compact and provides unmatched portability due to its structure and build. Reflex sight reviews aim at highlighting a lot of these features and bring out some secrets that not a lot of people might know about. One of the most defining features of a reflex sight is the way that it operates and produces a red dot onto its reticle. First, a low power LED light is shone onto a lens. When the light hits the lens it is reflected back to the shooter’s eye, hence the reflex in the name. This allows it to produce a strong a reticle. Additionally, a reflex sight also boats faster target acquisition times at close range. Let’s say if your target is about a hundred yards away, the reflex sight will zone in on that target much faster than the other sights. However, at distances over 300 yards, it is recommended to either to use a magnifier or move on to scopes instead. Another secret feature is the fact that you can use the reflex sight with both of your eyes open. That is, when aiming down sights, you do not need to close one eye in order to get a better aim. This is quite helpful in close quarters in the event that you need to be more aware and attentive to your surroundings. Therefore, a combination of faster close quarters target acquisition and the ability of the sight to hold the zeroed in the target in addition to letting you keep both your eyes open, makes it a prime candidate for choice in those situations. In addition to the aforementioned functional advantages of reflex sights, they also provide some consumer-friendly features which make them a viable option for customers and are often highlighted in most reflex sight reviews. Magnification: Although most are unmagnified, a lot of reflex sights do offer magnification options in the form of an additional magnifier that helps to increase the range of the sight. Although this does tend to make the sight as a whole heavier than other riflescopes, it helps the rifle diversify and perform in a variety of scenarios. Functionality: Reflex sights sometimes compromise on parallax correction but they offer unlimited eye relief allowing users who wear glasses to use the sights as well. This cannot be said for prism scopes or traditional binocular type sights. This is another reason why people are drawn towards Reflex sights. Build: Reflex sights are generally much lighter than their counterparts making them easier to carry around in any situation. Combined with their sturdy build, with some manufacturer adding the option of a high-grade mounting rail, these sights will help you perform in any situation without adding any difficulties.Most reflex sights offer a sufficient field of view and are even fog proof allowing it to function even in harsh cold conditions. There are many reflex sight reviews on YouTube showcasing torture tests for sights and highlighting just how durable these sights tend to be. Although most reflex sights these days come with their own mounting systems, it is important to ensure that there is no wobble when using the rifle and the sight is securely fastened to the rifle in order to deliver an accurate and precise aim. Therefore it is better to check some reflex sight reviews on proper mounting systems. Cost: A standard reflex sight is also easy on the wallet. Although there aremore expensive brand names reflex sights, they are still somewhat cheaper than the other sights on the market. Therefore offering you some flexibility when choosing a perfect sight for your rifle. However, if you compare it to the prism scopes, which are way cheaper due to its simple construction, you might get confused about the entire sight market. That’s why you shouldn’t compare the prices with other types of sights. Battery Life: Batteries are an important feature in a reflex sight as you may want to go a very long time with your rifle without the need to change the batteries too often. Moreover, in the case of an emergency, you would not want to find yourself in a situation holding a rifle with a reflex sight with dead batteries. And so, a sight with good battery life is important. Therefore manufacturers have focused on providing longer lasting batteries that go on for 10,000 hours before needed a change. However, some manufacturers are adding in rechargeable batteries to their sights. Choosing one is entirely up to preference but the choosing rechargeable ones might be more cost efficient in the long run. In addition to all that, some sights come with an auto-shutoff mechanism that helps conserve battery life. A good battery life is an important topic of discussion in reflex sight reviews. Customizability: Most of the reflex sights come with additional options to change the reticle. While most come with the option of a red or green reticle, some manufacturers take it a step further by allowing you to the change the pattern of the reticle itself to just a dot, a center circle with a wider outer circle or even the usual crosshairs. Additionally, reflex sights offer reticles which tend to vary in brightness, giving you the choice to pick a sight with a reticle best suited to your needs and preferences. Many reflex sights come with additional features and add-ons specific to each manufacturer like height adjustments in addition to the standard reticle adjustments. However, most come with only the basic features that allow you to slap on a reflex sight to your rifle and get down to business. 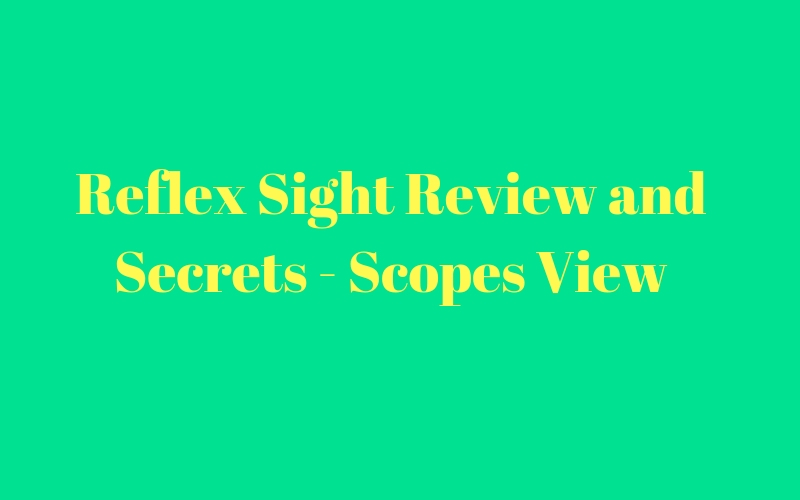 Information about these extra features is available in reflex sight reviews. Reflex sights are a handy and feature-packed addition to any rifle that will greatly help make accurate and precise shots.